← 2 Pic of The Day? Can You Tell Us The Occassion???? Zephyrhills Hosts Draw Doubles DISTRICT Tournaments!! The Zephyrhills Shuffleboard Club hosted the Central District Shuffleboard Championship Tournament for Pros and Amateurs starting on Thursday, November 8th. Both Tournaments put out large numbers of players. There were 56 Pros and 58 Amateurs totaling 114 players which makes the tournament the largest by number in the whole State this season. 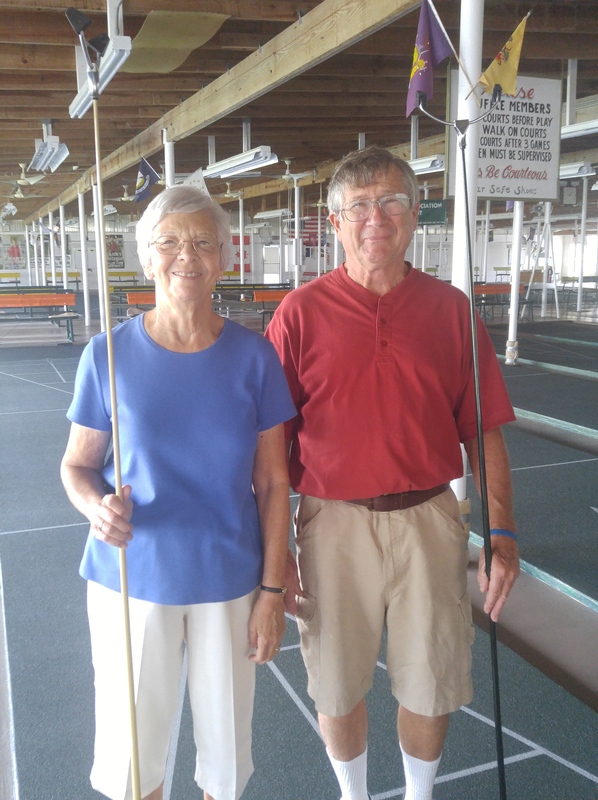 Zephyrhills is definitely the Shuffleboard Capital of Florida. Mary McLin of the Betmar Club, one of Zephyrhills finest Female players teamed with fellow Betmar player Rick Johnson, who is ever dangerous in every match and they were able to win the Pro Championship. 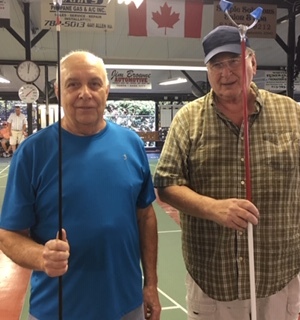 In the Championship deciding match They and their Opponents each had won a game & the 3rd was exciting because Mary & Rick were down early –6 to 32, fortunately for them they were able to back the opponents up with 2 kitchens while making their hammers. The game was tied at 20-20 with 3 frames to go. The Opponent on the head made her hammer so it was 28-20 with no score from the foot. On the next to last frame, Mary scored her hammer with an 8 so the score was tied going into the last frame. Rick managed to stay out of trouble & on his hammer had to shoot at the opponent’s 8. He hit the 8 & scored but only bumped the opponent into a 7. Mary and Rick had won the Championship deciding game by 1 point 36 to 35. The Amateur Tournament was won by Zephyrhills Club members Ross LaCombe and Steve Worchester; both fine Amateurs.